As soon as Cheryl pointed this project out to me, I knew we had to feature it here on the blog. 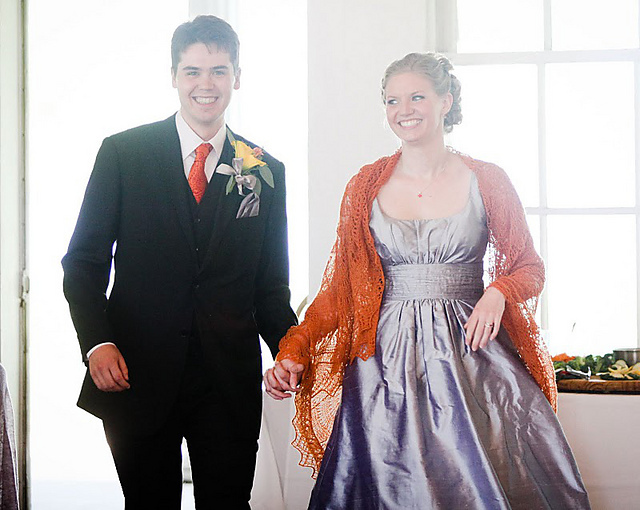 Silky Alpaca Lace is the perfect yarn for heirloom pieces, and what day is more special than your wedding day? Amanda Robertson, the extraordinary knitter behind this piece, was kind enough to answer some questions for us. 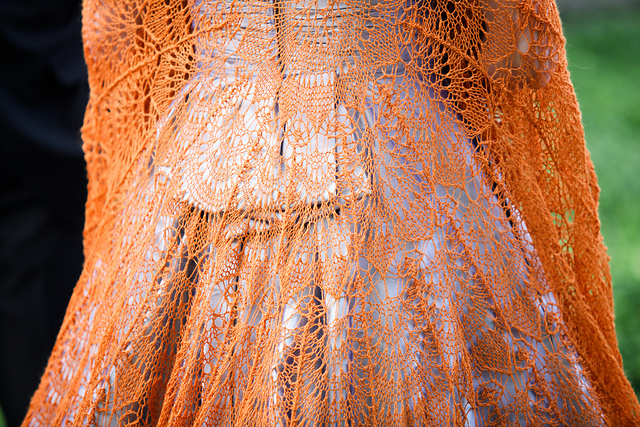 Are you a big lace knitter? I don't really consider myself a big lace knitter, but I'm always up for new knitting challenges. Before my shawl I had only knitted one other lace project, which was a stole for a friend to wear at her wedding. What made you decide to undertake such a complicated piece? What was your inspiration? 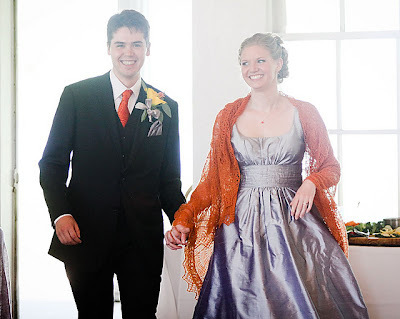 I knew I wanted to have a very handmade wedding, so a knitted shawl seemed like an obvious piece of that to me. I honestly have no idea why I picked such a complex pattern - I don't think I knew what I was getting myself into! I looked at tons of patterns and projects and fell in love with circular shawls worn as veils. Spanish Peacock really stood out to me and I love that it was a project Meg Swansen created for her daughter's wedding. I didn't wear mine as a veil in the end, but that's where my inspiration came from. How did you find the experience? The yarn? It was frustrating to knit at times, but really rewarding. It took me ages to get the cast-on right, I made some major mistakes, and I struggled with parts of the pattern, but it was so fun to see the pattern emerge and the shawl grow. I loved the yarn! It's so soft and in six balls I didn't have a single knot or flaw. I initially fell in love with the color (I had a certain shade of orange in mind), and it also happened to be fabulous yarn! How many hours a day did you devote to it? Were you a "monogamous" knitter? At times I was working on it 3 or 4 hours a day. At another point it was in a zip-lock for 5 months straight when it was summer, we were moving, and I couldn't stand to look at it anymore. I took a couple of breaks to knit other small projects, and plenty of breaks to sew and craft for the wedding. I guess I was a serial monogamist! Do you have any advice for someone who would want to attempt something like this themselves? I say go for it! Do your research and read the project notes from the many wise people on Ravelry - I learned so much from the notes of folks who knit Spanish Peacock before me. Also be sure to give yourself plenty of time to take breaks and fix mistakes! I just started on Evie, a cardigan by Kim Hargreaves from Thrown Together. I'm such a slow knitter, so I think it will take me awhile! Thank you so much..I have the book..Whoopee!!! That is such an impressive piece of work. The shawl looks even better in person. Its absolutely stunning! I can't believe she had only knitted lace once before. A fantastic achievement. Truly an achievement worthy of such a significant day. Congratulations. What wonderful colours and the idea of lots of handcrafted touches for your wedding is completely charming! Great persistence on this big project, and good for you to demonstrate that lace is not difficult to do. Lots of tips on Ravelry! Very inspiring. My daughter is only 15 so maybe I should start working on one now. How on earth did you block it? Completely amazing. I knitted my wedding veil and that already drove me nuts. 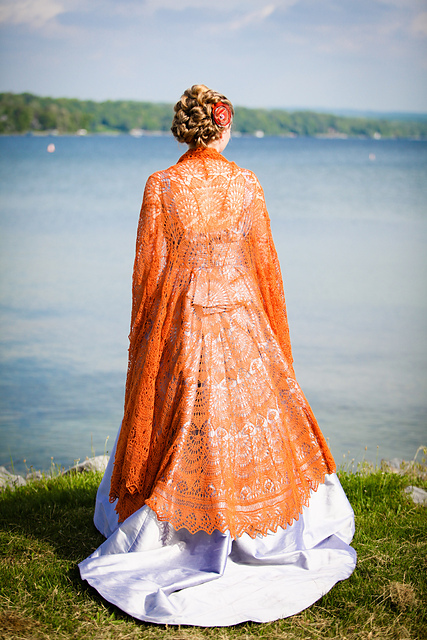 Your shawl is stunningly beautiful, and it set your dress off so beautifully! You looked fabulous! Oops, I meant to reply to you, but instead posted below! Thank you! I blocked in the living room of my apartment, and it took up most of the room! I borrowed a couple of sets of blocking mats, but I still didn't have enough. I just pinned to the carpet instead. I worked from the center and tried to keep the radial lines straight. I pinned one circle at a time and measured to keep everything true. It took ages! Indie Designs in Classic Elite Yarns! More New Liberty Wool Print Colors and Patterns!